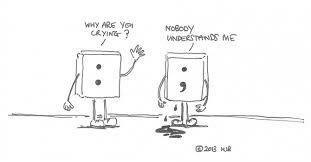 I was asked how/when to use a colon and a semicolon. Use a colon to set off a summary. There were so much food at the party: chicken pie, curry fish head and french fries. This is stronger than a comma, less forceful than a full-stop. Here are the following scenarios to use a semi-colon. Do note the use of semi-colon has been in decline and not many like it. EG: I hate cats; I prefer dogs. b) Use a semicolon between main clauses linked by a conjunctive adverb (such as however and therefore) or transitional expression (such as in fact or for example). EG: She is very protective of her baby; in fact, she doesn’t even allow anyone else to carry the baby.